The Dreamcast Junkyard: Sega Vs Vee. The rally games. b) Wasn't sure how to go about said articles. But that's all behind us now, as here I am in a desperate bid to update you on my DC gaming experiences of the last few weeks. One of these includes the purchise of V-Rally 2: Expert Edition. I did pick this up at a boot sale for a quid, but the disc was so scrathed up it wouldn't even play, and just made nasty clicking noises in my Dreamcast. It was soon removed and thorwn in the bin. I won't be having poorly kept games hurting my little baby. There, there, sweetie, it's all right now, I got you another copy at the Balsidon Gamestation for the usual 2 for a fiver deal (along with F355 Challenge, because there wasn't much else there I didn't have, and hell, I normally get £3 each back for these things at Bootsales anyhow). Back to V-Rally 2, then. Now, as much as I like Sega Rally 2, it was far from perfect. The PAL version ran only in 50HZ and at half the frame rate of the NTSC versions, and for a game that really doesn't have much to memorize, it sure takes up a lot of blocks on a VMU. Now V-Rally 2 ay not be perfect either, but it does manage to do a lot of things right and more or less wipes the floor with Sega's title, as much as I hate to say it. For starters, Sega Rally 2 had a few tracks, but in comparison that's nothing on what V-Rally 2 gives you. Across about 10 countries there are over 80 tracks to get to know in this game, and a lot of modes to play them in too. There is also a lot more cars to pick from, with plenty more to unlock. As for the controls, they work well but this game doesn't play toowell with the Racing Controller. Also, your car tips over far too often. At times it doesn't even feel like your car is on the ground as it appears to hover about the track and rolling over at every little bump, almost as if you're driving a fat cat on wheels over jelly. Still, it's not too bad, once you get used to it. But the real highlight and selling point of the game for me has been the track creator. 80+ tracks or not, there's nothing like being able to save your own designs, and the constrution kit is very simple. Also, each track you save only takes up 4 blocks on a VMU, so you could in theory make a whole games worth. This is where I've been playing hours and hours of the game, trying to produce the most roller-coaster like tracks I possibly can. The first level I saved doesn't have many turns, but is slew with hills that throw the hapless car into the air. I also put one together with loads and loads of shrap turns, and one that goes in one long line going down hill, again with the odd make-the-car-fly moment. I've even recorded footage of some replays from my designs to show you below. Great fun. 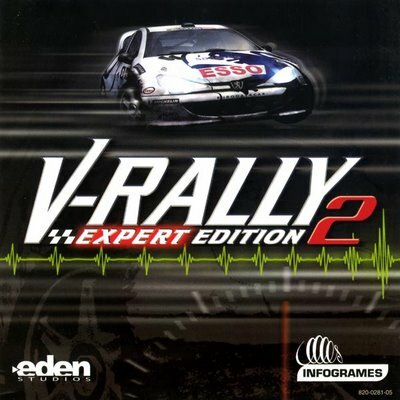 In conclusion, V-Rally 2 is well worth picking up, just like all of Infogrames other Dreamcast racing titles Le Mans 24, Wacky races and Loone Tunes Space Race. i remember v-rally well. the car rolling over a bump the size of a wedge of cheese. still it was a fun game to play! I love v-rally. It's really fun, and with the hability to create your own tracks it really worth playing it. Here's a little gift for you guys :D. All the loading screens from the game. With all the cool renderings and such. much obliged wilhelm - thanks for reading!